fermentation fervor! 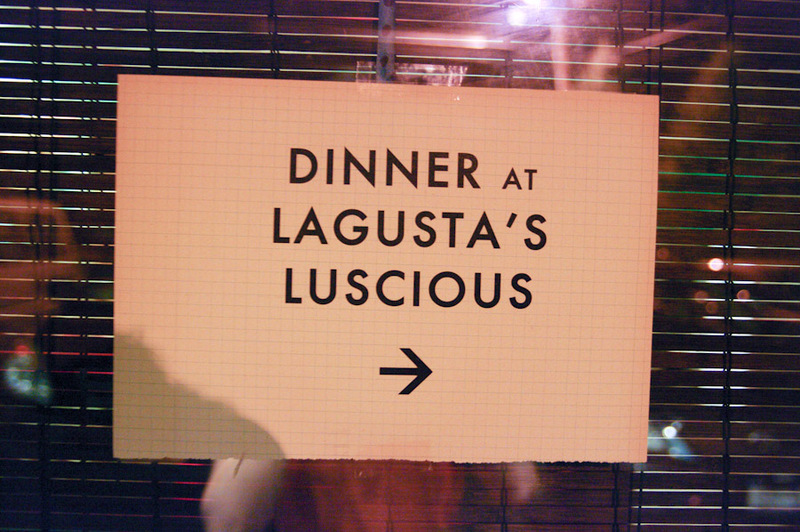 | Lagusta's Luscious! 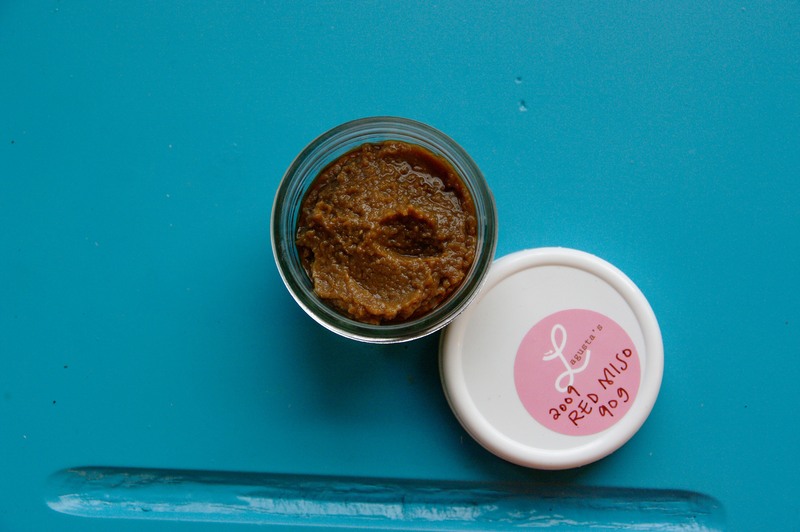 40+ uses for miso! YES! 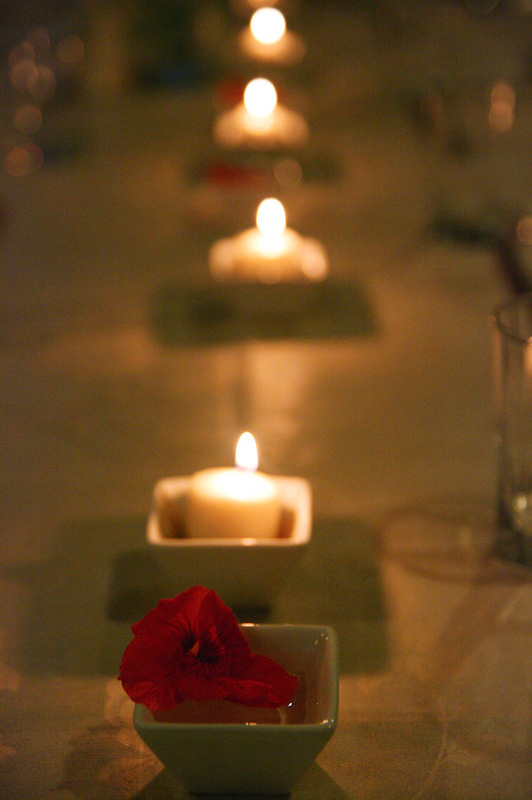 First, check out my miso primer post. Then, let’s get down to business. As an emulsifier. If you make salad dressings at home, you will quickly tire of using mustard as an emulsifier for simple vinaigrettes. White miso works just as well (if not better) at helping those continual enemies, oil and water, to play nicely together. Be sure to use less salt than usual when using miso in dressings. Miso-tahini dressing: The health food restaurant classic. Blend together white or brown miso, tahini, a neutral oil like grape seed, shoyu, and a little garlic chile sauce (if desired), minced garlic (if desired), ginger juice (make ginger juice by grating ginger then squeezing out the juice), brown rice or apple cider vinegar (lemon juice is also nice), and fresh pepper to taste. Add water to make a smooth consistency. Caesar salad dressing: There’s a guideline for a recipe here. Lime-sesame-peanut dressing. Combine peanut butter, agave nectar or maple syrup, sesame oil, white miso, brown rice vinegar, shoyu, and lime juice to taste. If you have any lime oil (Boyajian makes wonderful citrus oils), add a dash as well. Blend with warm water to make a smooth consistency. Ginger-carrot miso vinaigrette: Combine grated carrots, minced or juiced ginger (use a Japanese ginger grater to get ginger juice quickly and easily), a tiny amount of minced garlic, rice wine vinegar, a spoonful of your favorite miso, and toasted sesame oil and olive oil. Combine well, then taste and adjust flavors as necessary. Combine all ingredients except oil in a blender jar. Blend while drizzling in olive oil. Add water if dressing seems too thick. Taste and adjust flavors as necessary. As an all-purpose flavor booster. When making hearty, rich dishes that traditionally contain veal or beef stock, a spoonful of hearty red miso adds an amino acid/umami flavor boost and depth of flavor. With an acid. Miso + something tangy and acidic are natural mates–the zestiness of lemon juice (pictured above is some amazing black bean miso I made, waiting to be blended with another fermentation project–preserved lemons) or vinegar (brown rice is always nice) makes most any dish sing just a little louder. 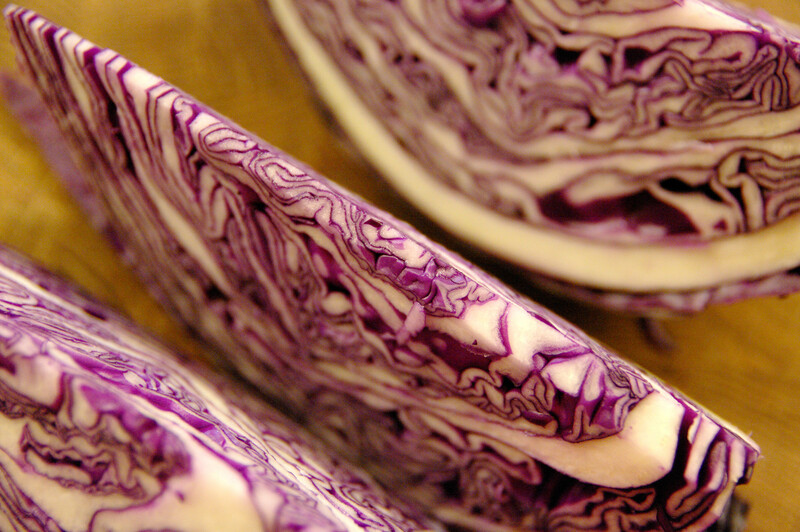 As part of a smooth, creamy sauce for steamed or roasted vegetables. For my meal delivery service, I used to serve a springy dish of steamed newborn turnips (hey, that blog post is so great–go read it!) (Hakurei turnips are a mild, sweet, creamy, juicy Japanese variety that several farmers near me–and maybe you?–grow) with an inch or so of their green tops attached with a simple miso sauce made from olive oil whisked together with white miso, rice vinegar, mirin (or sake or white wine), sugar or agave syrup, and some shoyu. As a glaze for sautéed vegetables. Combine vegetables that have been sautéed until just beginning to brown with a glaze made from white miso, rice vinegar, tahini, minced fresh ginger, shoyu, sesame oil, and sugar. Cook over medium heat until glaze is slightly thickened, then season to taste with sea salt and fresh pepper. Slather on vegetables, then broil. Miso-glazed broiled vegetables make a perfect weeknight dinner: Mix sweet white miso with some sake, shoyu, mirin, and sugar, then slather on thick slices of eggplant, summer squash, or portobello mushrooms and broil until bubbly. This also works well with tofu. In Japan, there is a tradition of dengaku cooking, which refers to foods that have been grilled, then coated with the above mixture and grilled again. Add a little as a secret ingredient in homemade red curry. Hearty pasta sauces benefit from a little white or red miso stirred in at the end of cooking–a tomato sauce enriched with red wine, plus a little miso, is pretty amazing. For a boost of flavor and nutrition, you can add a spoonful of miso to any soup. 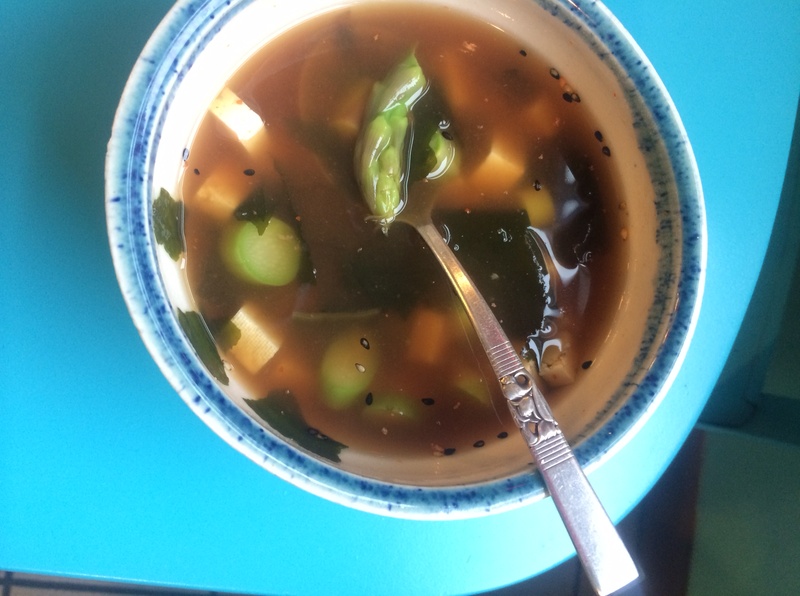 Or, try my quick favorite miso-enriched soup recipe: bring water to a boil, and add any sea veggies you happen to have on hand, (kombu is perfect) as well as any leftover chopped vegetables you need to use up. (If you want the rich flavor that sea vegetables contribute but not the texture or direct flavor, just strain them out after simmering for twenty minutes or so and before adding the vegetables). 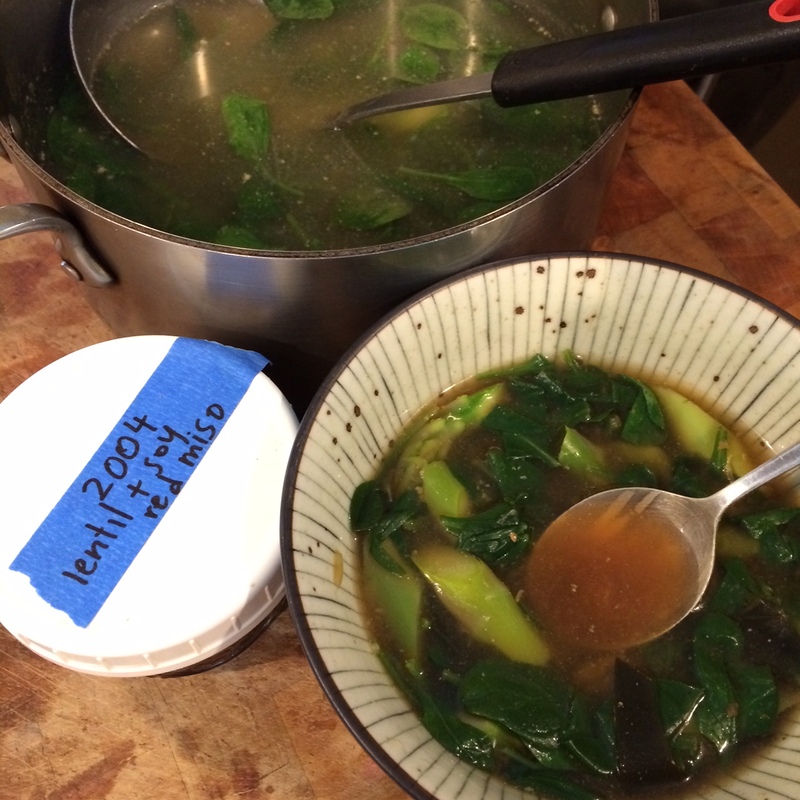 In a big bowl, add a little bit of this broth and mix with your favorite miso. Add cooked rice or noodles (or quinoa, cous cous, millet, Bhutanese red rice—the list is endless! 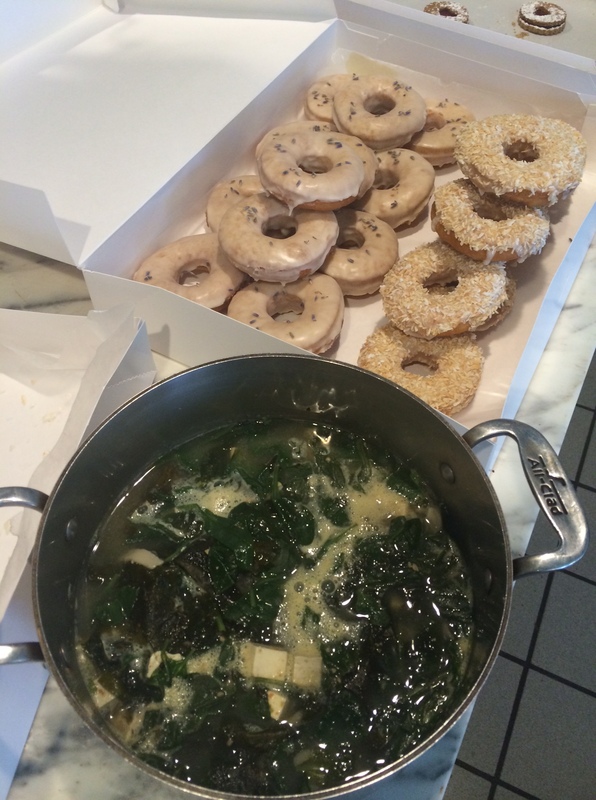 ), some chopped greens if you have them, then fill up the bowl with the broth. 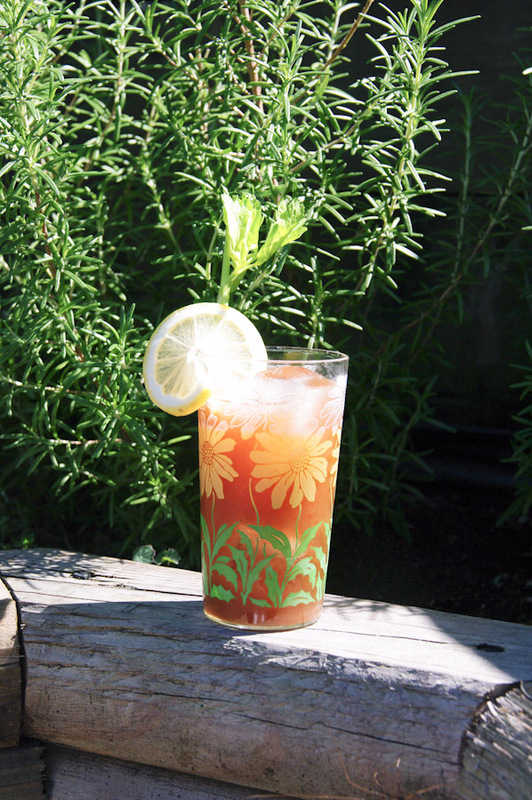 Garnish with slivered scallions, if available. Not flavorful enough? Add more miso. Add hot pepper sauce and shoyu to taste, and I often add some brown rice vinegar and a dash of toasted sesame oil as well. A spoonful of miso blended into thick bean soups adds great depth and richness. Miso gravy. I made this recipe for years at Bloodroot, and it’s one of the most comforting sauces you will ever encounter. Caramelize lots of onions (plus sliced shiitake mushrooms, if you have them) in an obscene amount of olive oil. Add a lot of sliced garlic (sometimes I add some ancho chile powder, too) then whisk in a handful of flour, a bit of dried basil and thyme, and a cup or more of dark beer. 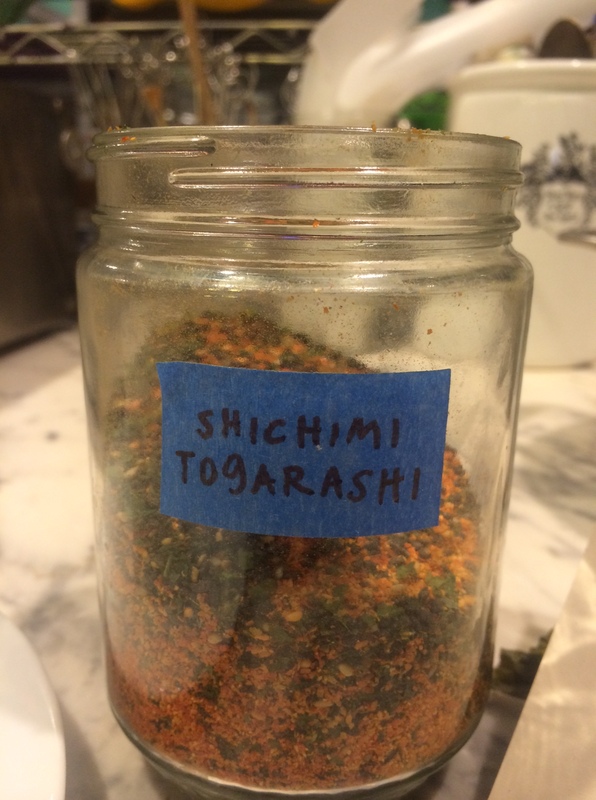 Add a big scoop of red miso and a big scoop of nutritional yeast, some tomato paste and some shoyu. Add water and whisk until it’s smooth and saucy. Let this gravy bubble away for 20 minutes or so, then put it over mashed potatoes, stuffed vegetables…or just straight up in a shot glass. Whisk a little miso with olive oil and spices, brush on sliced kabocha squash or other wintery roots & roast. I use a few spoonfuls of white miso in my homemade tamale batter to boost flavor. In nut-based cream sauces. See info and recipes here. In pesto. Adding just a tiny spoonful of white miso in pesto can help emulsify the mixture, and also contributes a cheesy richness. Miso (any type) and stone-ground mustard makes a wonderful condiment—use it anywhere you use mustard. In a cream layer for lasagna and savory baked casseroles. I make a polenta torte that consists of layers of cooked polenta (which has been poured onto a sheet pan and chilled until firm), tomato sauce, sautéed mushrooms, and a filling made from a bit of white miso, garlic, tofu, cashews, nutritional yeast, shoyu, white wine vinegar, and basil. Combine everything in a high-speed blender or food processor and mix until smooth. Taste and adjust flavors as necessary, then layer in a casserole dish and bake in a 375°F oven until bubbly. In the Classic Sichuan dish Ma-po Tofu. I’ll post my recipe soon! Make a quick Korean Barbecue Sauce with minced garlic and ginger, paprika, cayenne (optional), white miso, toasted sesame oil, and shoyu. Use on baked tofu or tempeh, or toss with sautéed vegetables like baby bok choy and summer squash, then garnish with sesame seeds and slivered scallions. I’ve been making this dish for years, but I believe the original idea came from a Millennium cookbook. Sweet white miso is lovely spooned into a bowl of hot oatmeal, grits, or cooked grains, along with maple syrup and fruit. White miso whisked with olive oil is great on fresh corn on the cob in summertime. Miso ice cream! I’ve done it! Just add a small teaspoon to your (vegan) ice cream mixture and mix well. This is especially good with strongly flavored ice creams where the bold flavor of miso contributes a nice salty hit but doesn’t overpower. I asked a few friends on Facebook for their miso tips, and the great Sandor Katz recommended savory oatmeal with miso & peanut butter. Sounds like a perfect winter breakfast. I’d sneak in some maple syrup, too. Miso pickles. 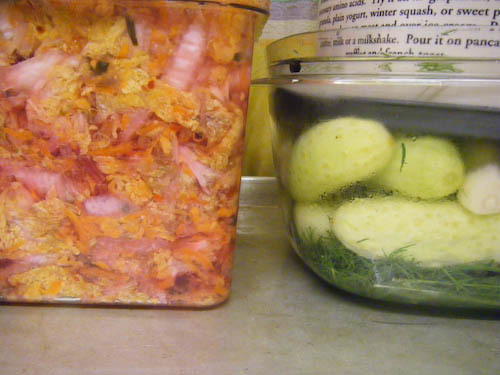 Speaking of Sandor: there is a long tradition of pickling vegetables in miso in Japan. 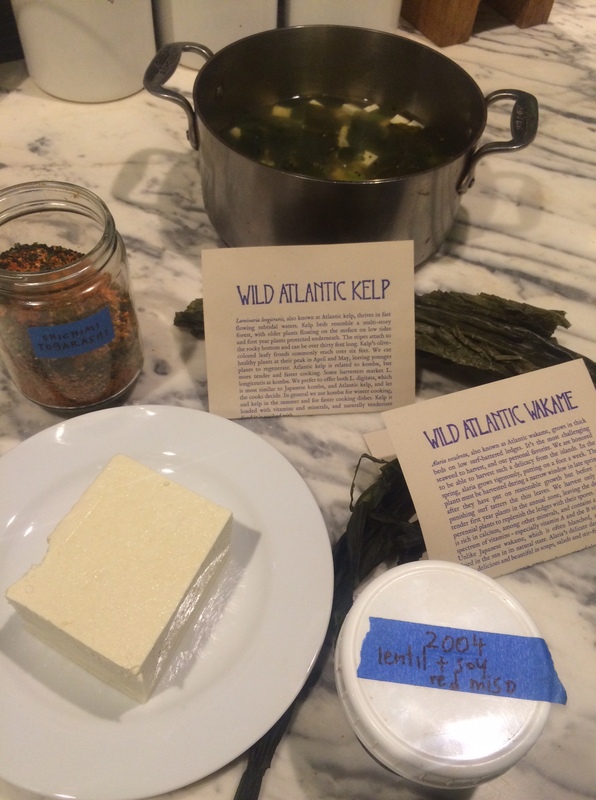 See Sandor Katz’s book Wild Fermentation for a detailed recipe. A bit of red miso livens up homemade tomato sauce, especially thick, rich, long-cooking winter tomato sauces. Any marinade for tofu, tempeh, or vegetables is better with a bit of miso added. A really fine miso, like the ones made with farm-fresh vegetables from South River Miso, are wonderful spread directly on good crackers, and even better when mixed with a little tahini and spread on crackers. If you’re fond of the Australian condiments Marmite or Vegemite, think of miso as a Japanese version of them, and use it wherever you use these condiments (which I must admit I find terribly bizarre). Blend a bit of red miso into your favorite bean dip recipe. I love mashed potatoes with a tiny bit of barley miso added. A great sandwich spread is mashed avocado with a drizzle of olive oil, balsamic vinegar, chopped sun-dried tomatoes, a bit of red miso, shoyu, and a whisper of garlic (usually I just rub it on the bread). This is a variation of a sandwich the great Bloodroot restaurant, where I worked for years, makes. Any sauce that needs a little thickening benefits from a bit of miso whisked in. The quickest vegetable stock in the world: boil water with vegetable trimmings and, ideally, some good seaweed like a big strip of dulse, and a little bit of red miso. Bonus! Speaking of sweets, try adding a tiny bit of sweet white miso to caramel sauce, cookies, and other sweet treats. It’s pretty amazing. All about miso: the soy [or not] food with culture. 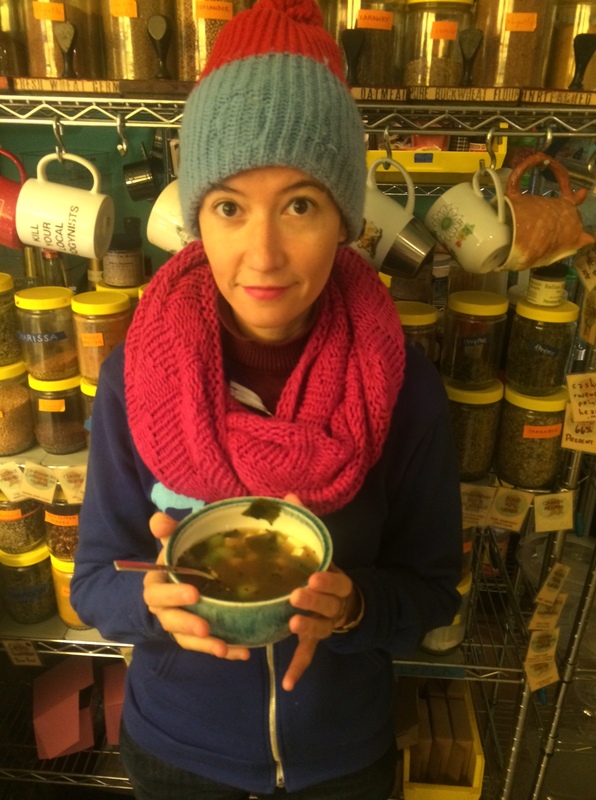 We sell our homemade miso at the shop, so I thought I’d write a little about how I use miso and why I love this ingredient so much. My love for miso is too large to be contained in just one post, so here is a pair of miso posts: today’s is a primer on what exactly miso is, and tomorrow I’ll post a truly huge list of amazing tips, techniques and recipes for your miso. Miso is a power ingredient, and it’s my firm belief that no kitchen should be without a jar of white and a jar of red miso. First of all: what exactly is miso? 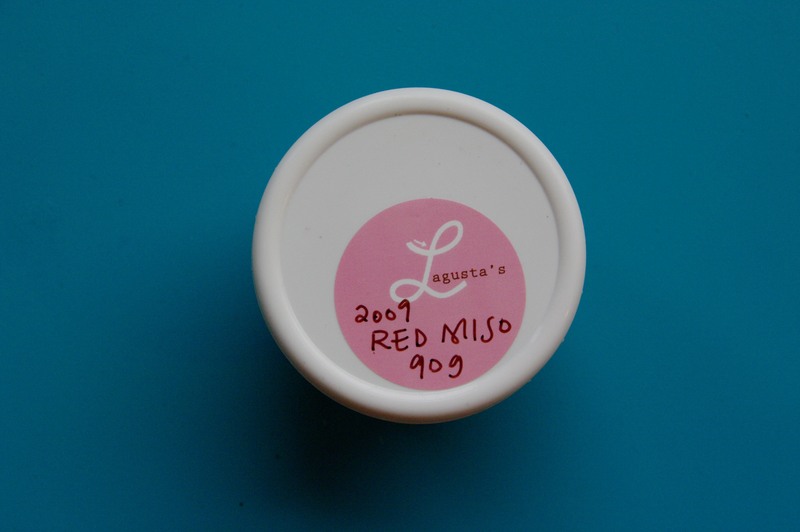 The red miso pictured above, before two years of fermentation made it red. Good question. Miso is a fermented bean paste. 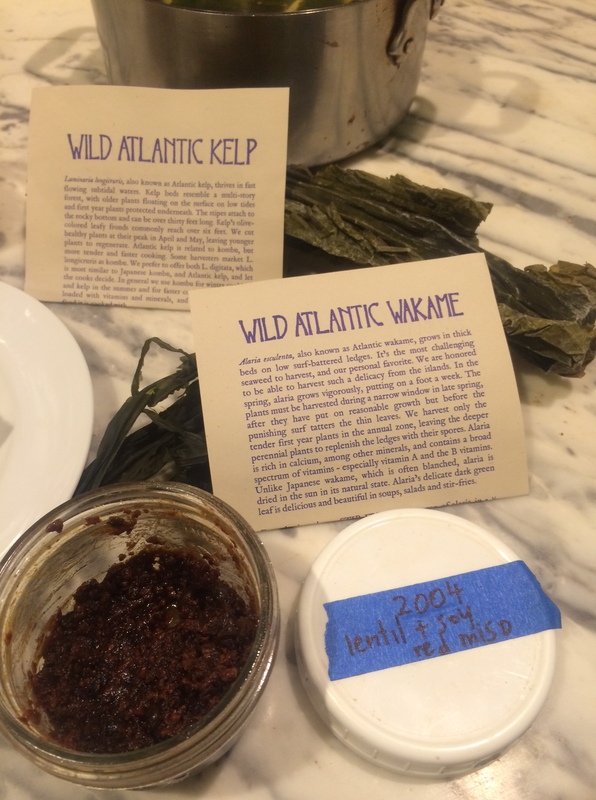 It’s a salty, umami-rich ingredient that lends depth, richness, and body to any dish it touches. In fact, tamari (wheat-free quality fermented soy sauce) has traditionally been made from the liquid exuded from fermenting miso. Miso often works very well to replace soy sauce or sea salt, and though it is of Japanese origin, its flavor can compliment many kinds of dishes. The trick is in knowing what kind of miso to choose. Different types of miso can refer to either how fermented the miso is, or to what ingredients are in it. The vast majority of misos in the world contain soybeans, but homemade miso can contain whatever beans and grains you like. For the past decade or so I have been making miso myself. It’s a deeply satisfying practice that I can’t recommend enough. I have made miso with many different beans, grains, and even vegetables. Making miso is a simple process, but the fermentation times can be long. 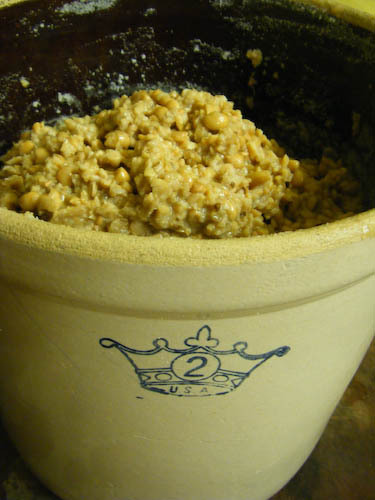 The feeling of accomplishment in unpacking a crock of one-, two-, or three-year old miso is intense. 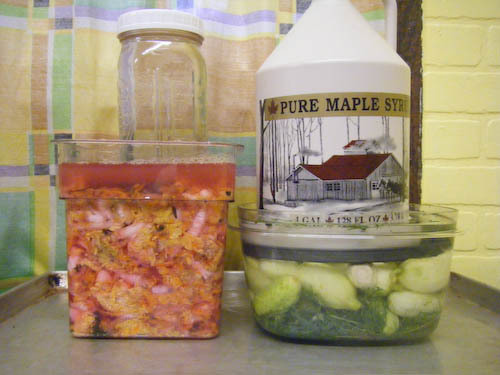 For a great recipe for making your own miso, Sandor Katz’s Wild Fermentation is a wonderful reference. If you’re not up for making your own miso from scratch, you can buy wonderful miso in every health food store. In the Northeast, my favorite brand of store-bought miso is South River. 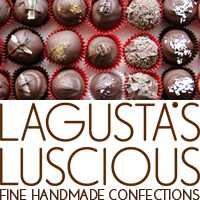 It is made in small batches with care, and many seasonal varieties are often available. Miso Master is another readily available quality brand. There are two primary types of soybean miso available in the United States: red and white. White miso is fermented for only a few months, and is therefore much lighter in color and less salty. It is often called “sweet miso” and has such a tame, mellow flavor that it pairs well with all kinds of dishes. 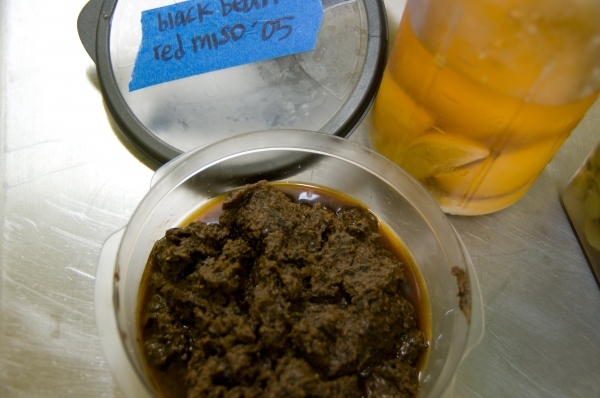 On the far other end of the spectrum, red miso is a bold, rich, tangy paste that has been fermented for several years. The only difference between red and white miso is the level of salt and the fermentation time—the fermentation process is what changes the color from white to red. 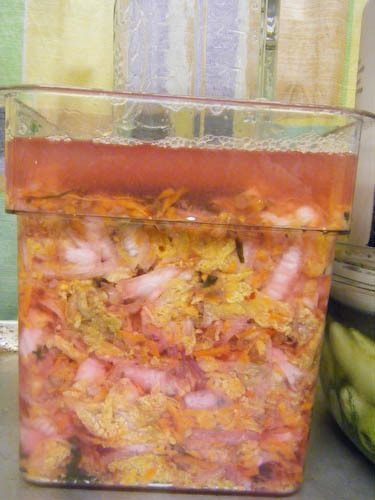 The miso pictured above, while fermenting. Brown miso, which is a middle ground between white and red, is often available as well, as are misos made with rice, chickpeas, barley, and more. They are all delicious, and all contribute slightly different flavors to dishes. Experiment to see which you like the best. When buying miso, make sure that it is refrigerated and labeled “unpasteurized,” or “live.” Cheaper shelf-stable misos have been heat-treated and are devoid of the beneficial bacteria that make real miso one of the healthiest foods you can eat. Speaking of that beneficial bacteria, several of the techniques listed in tomorrow’s list of miso recipes will, indeed, kill it by heating it. This is not ideal from a health standpoint, but even miso that has been boiled or baked is a superbly healthy product. If you are buying miso that you know will be heated, you might want to save a few dollars and buy the shelf-stable brands, as long as they are organic or state that the soybeans are not genetically modified. For more information on the health benefits of miso, the vintage classic The Book of Miso has all the info you need, and lots more. 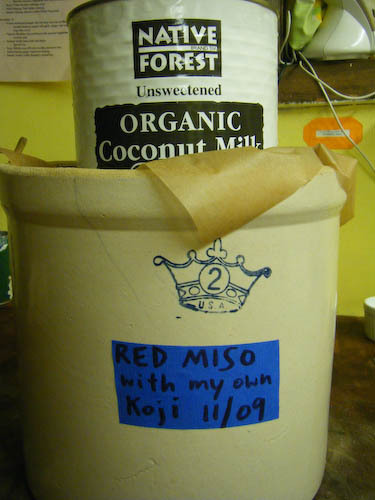 Once you have your miso, it can be stored in your refrigerator almost indefinitely, slowly improving with age. 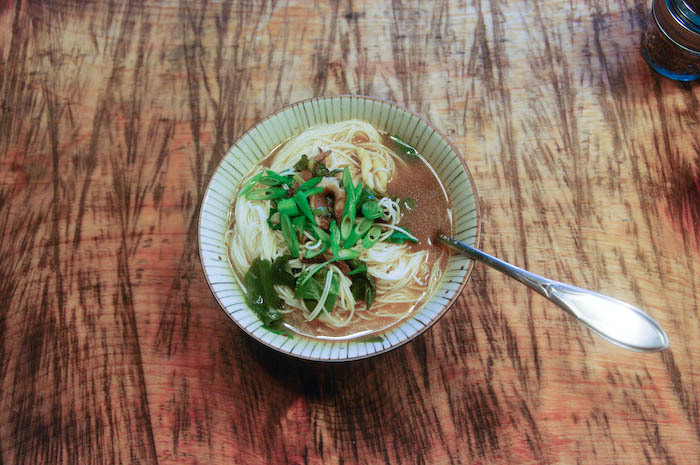 But there are many reasons not to let it languish on a shelf in the refrigerator–coming tomorrow, 40 uses for miso! Sandor Ellix Katz’s The Revolution Will Not Be Microwaved: Inside America’s Underground Food Movements more than exceeds its tagline as “an instant classic for a new generation of monkey-wrenching food activists.” Covering all areas of the under-the-radar food world, from urban guerilla farmers to radical seed savers and foragers of all stripes (mushroom hunters, weed-eaters, dumpster-divers) Katz – whose previous book, Wild Fermentation, is a strangely readable and fascinating guide to the pleasures of fermented and live-culture foods – makes the case that we can solve the problems of our corporatized and corrupted food system with creativity, community, and good taste. I recently discussed the food sustainability movement with Sandor Katz. Lagusta Yearwood: What is your sense of how “everyday people” – not people in the “foodie” world, not food activists, vegans, chefs, etc. – are thinking about food lately? As a society, are we beginning to have more of an understanding of food sustainability issues? Sandor Katz: Many people in the mainstream are very concerned about food quality, from trans fats to artificial growth hormones to pesticides. That’s why we’re seeing all the policies banning junk food from schools, and that’s why Wal-Mart is expanding its offering of organic products. Neither of these examples really touches on sustainability, though. Centralized systems—whether government policies or corporate policies—won’t create sustainability. Centralized powers are invested in the model of commodity monoculture agriculture and globalized trade, which are antithetical to sustainability. Movements toward sustainability are happening everywhere—in forms such as community gardens, farmers’ markets, community-supported farms, and groups recycling discarded food resources—but they are still in the margins, not in the mainstream. 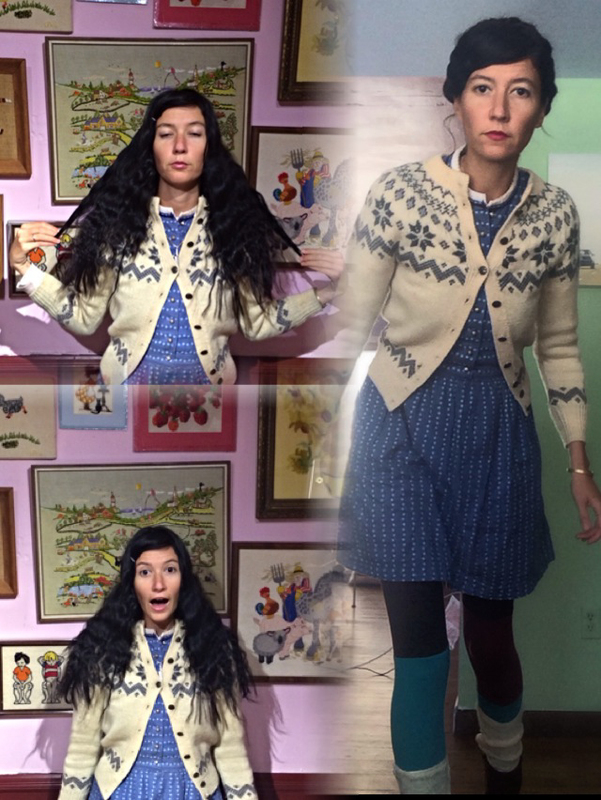 LY: Do you think that there are an increasing number of the movements that you describe, or are they slowly dying out? SK: I think grassroots movements for food sustainability are definitely growing. The numbers of community-supported farms and of farmers’ markets are rising fast. So are the numbers of schools, universities, and other institutions committing themselves to procuring foods locally. 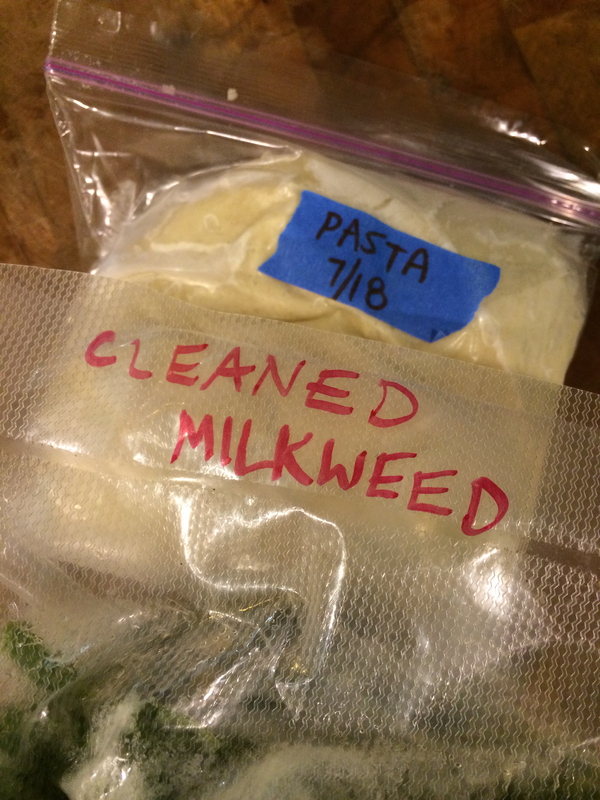 The raw milk underground is the most widespread form of civil disobedience in the U.S. today. Many people are being politicized as a result of their desire to feed their families healthy food. LY: There is a lot of talk about how Americans are becoming more and more polarized and there is less conversation between different segments of society. Your book documents slivers of society that are very much on the fringe working in these “underground food movements,” yet the people you write about have so much to teach the wider population. I wonder if you think they are somehow pushing above ground and influencing how mainstream Americans think about food? Are we having a revival of caring about what we put in our mouths, or is it just the isolated pockets that you discuss in your book? SK: Although these movements involve only a small minority of people, and exist on the fringes of society, I don’t think they are isolated pockets at all. For instance, the raw milk underground is populated by many totally mainstream people. These are people who have been compelled to circumvent the law out of concern for their health, or more often, their children’s health. Community gardens in many cities are tended by average working people, often immigrants, trying to raise some food for themselves and retain a connection to the land. Food activists come from every demographic category and are not a single isolated subculture. 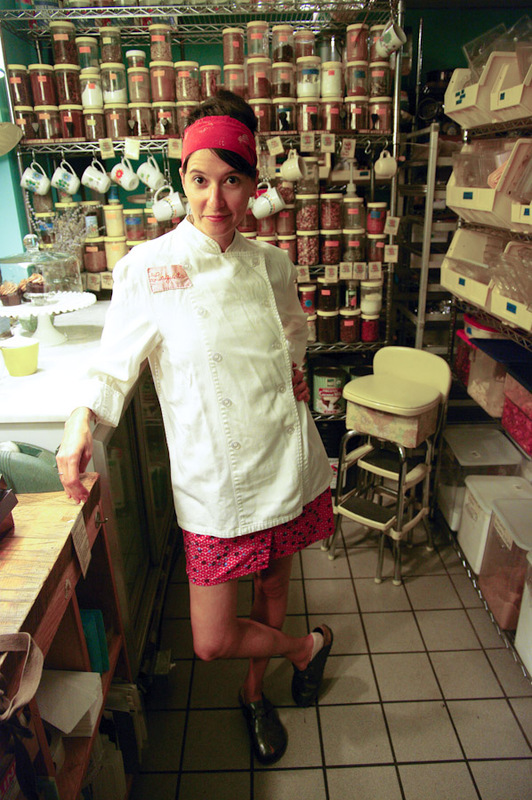 At the same time, many of the activist food movements have a narrow focus. We need to broaden this focus and build solidarity among the diverse range of movements that can be described as food activists. LY: Do you have any ideas on how to bring this dialogue to the wider population? SK: We need to keep on reviving local food systems and making them accessible. Food activists need to keep doing the work they are doing creating alternatives, while also broadening their agendas and their appeal. Everyone cares about food, and everyone hates to be judged. We can’t broaden the movement by shaming people for their food choices. We have to entice people by demonstrating how much more delicious, and how much healthier, locally-produced foods are. LY: It seems that many of the stories you tell share a theme: how we can wrest control of our lives back from corporations. Corporations control and mediate almost all aspects of our lives, especially food, and, as you point out, organic food is no exception. The stories of the anarchist farmers, seed savers, “fermentation fetishists,” raw foodists, scavengers, and foragers in the book are stories of triumphs of creativity, local thinking, and the “small is beautiful” principle over the ease of buying our food at Wal-Mart. Can you talk about some very simple ways we can begin to get corporations out of our food? SK: The first thing we can do to get the corporations out of our food is to start buying food directly from farmers. In the U.S., out of every dollar spent on food farmers receive about 19 cents. We can support farmers and stop supporting big corporations by buying food directly from local producers. We can also break out of the confining, infantilizing role of consumer and become food producers. Food activism isn’t primarily about protesting or boycotting; it’s about reviving local production and creating better food choices. LY: Related to that, how can we expand this pocket of food consciousness that you describe without commercializing it and having it be co-opted by large companies, like the word “organic” has been corrupted? SK: In the realm of food, we have to embrace an ethic of direct exchange, where people have relationships with the farmers who grow their food and the process of its production. This notion of local food production and exchange challenges and subverts capitalism’s tendency to market concentration and economies of scale. In computers or cars, those forces may arguably lead to greater efficiency. In food it’s leading us to ever-diminishing nutritional quality and resulting in disease epidemics and community economic disintegration. Every community needs a direct connection to farming and food production. It is the only true creation of wealth, and no community is secure without some direct connection to it. LY: I enjoyed your critique of the Slow Food movement because of its upper-crust aspect and focus on “highbrow consumerism,” yet I also share your viewpoint that they are doing wonderful things to promote biodiversity and stimulate interest in “endangered” foods. I like Slow Food because it focused on pleasure – the idea that one of the main reasons we need to eat what is local and fresh is because it just tastes better. 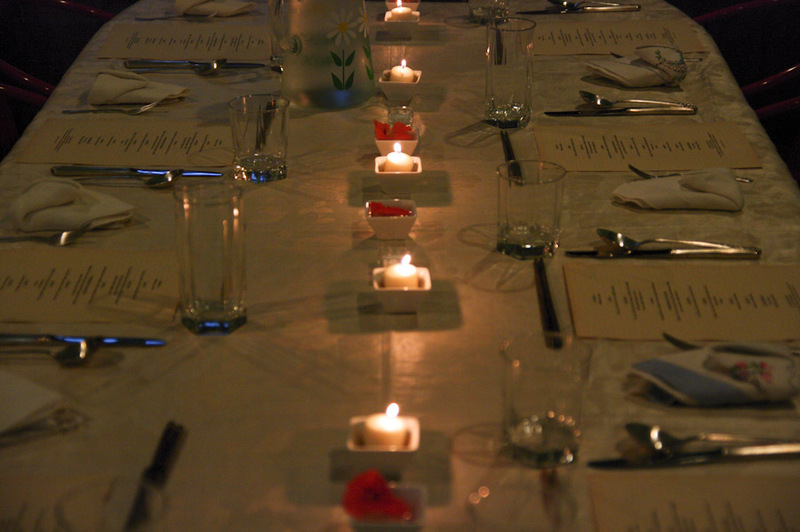 What do you think of the idea of a food revolution through the pleasures of the table? SK: I absolutely agree. Food is largely about pleasure and gratification. Changes in people’s food behaviors are primarily motivated by the pursuit of pleasure. As I said earlier, shaming people about their food choices is not an effective strategy for change. 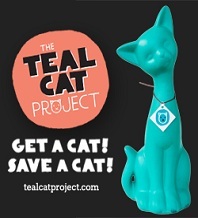 We need to entice people with appealing alternatives. When Gary Paul Nabhan organized a 12-day, 220-mile native foods walk in the Sonoran desert, he and the other participants discovered that they had dramatically more energy from eating native foods rather than standard processed supermarket fare. Behavioral change comes about from positive reinforcement. Fresh food, and real food, tastes better than the products that fill supermarket shelves, and it makes you feel better. 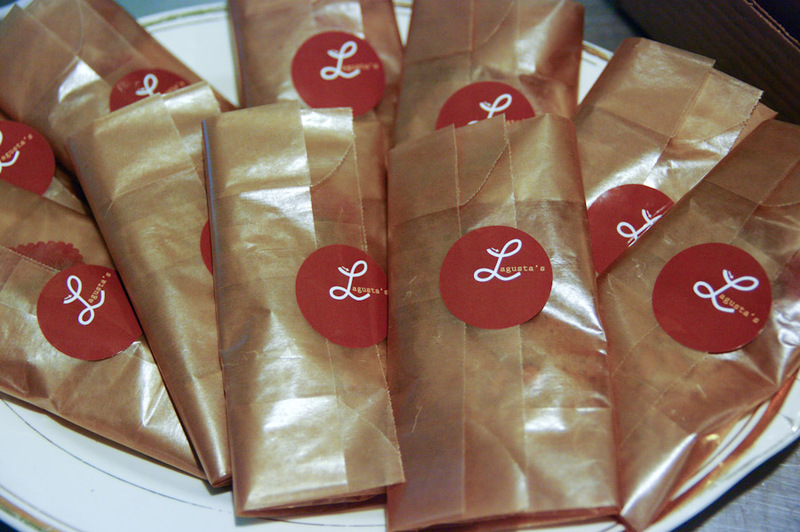 LY: What are your predictions for how we will be thinking about food in the next ten years? SK: I think in the coming decade we will be seeing devastating rises in cancer rates and other disease epidemics related to the poor quality of our food. I hope that more and more people will make the connections between these crises and food quality, and start seeking out and demanding real food unadulterated by genetic modification, artificial hormones, and chemicals. This means rejecting monoculture food systems driven by corporate profits and embracing small-scale local agriculture. Human beings, like all animals, are inherently capable of feeding ourselves. We do not need to be dependent on this profit-driven globalized food machine. We can liberate ourselves and take back our food, and we will.